Here’s Rachael Jones with another update from her cataloguing work! 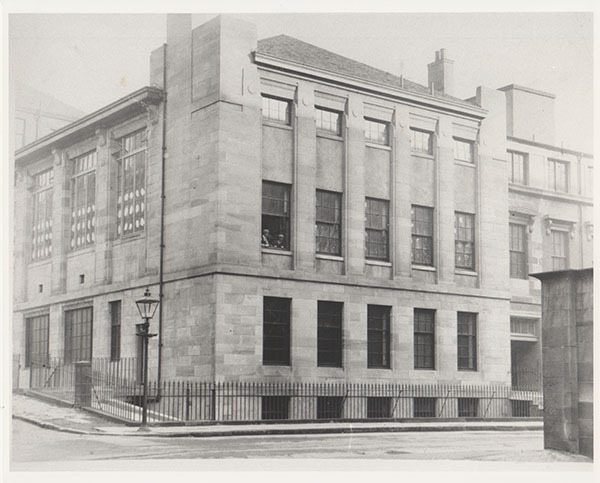 The records we hold of the construction of the Mackintosh Building between 1896-1909 hold the fascinating story of the birth of Mackintosh’s ‘Masterwork’ and the iconic home of the Glasgow School of Art. These records were already catalogued before I began my post as cataloguer and have been of vital importance in the current reconstruction of the Building. 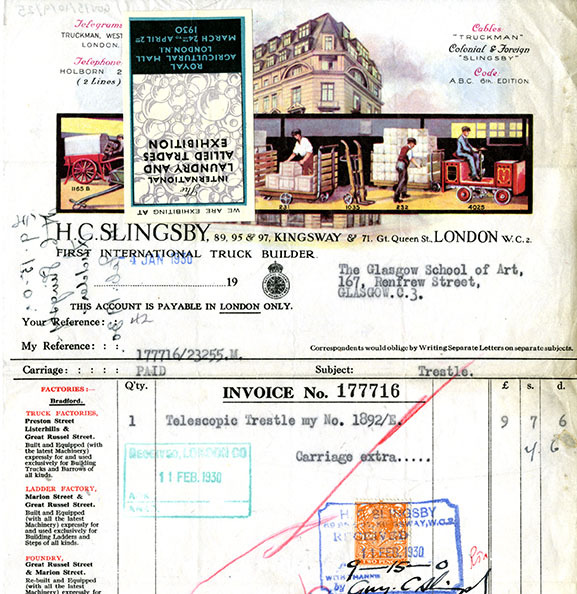 They contain documents such as the minutes of the ‘Building Committee’ who oversaw the competition and building work; Mackintosh’s, ultimately successful, entry to the Building Competition; and contracts and receipts for the building work that was undertaken. Perhaps less well known is the story of the School’s extension shortly following the completion of the Mackintosh Building. I discovered the papers for this expansion of the Art School and they are now catalogued and available for researchers under GSAA/GOV/5/10. In the years after the Mackintosh Building was completed, the School grew considerably and more accommodation was soon needed. Property on the opposite side of Renfrew Street was acquired between 1915-1926, as can be seen though legal documents and correspondence within the extension papers, and were used to provide temporary accommodation. The governors decided to convert these buildings properly and in 1926 issued an appeal for sponsorship to undertake this development work. The School got back in touch with those who donated to the Mackintosh building and also appealed more widely for more funds for this expansion. Notable individuals who were approached to contribute to the expansion include the Duchess of Atholl, Messrs James Templeton & Co, Glasgow carpet manufacturers, Sir John Stirling Maxwell, and Sir John J Burnet, and the School received many subscriptions from various companies, ladies and gentlemen, gentry, and private individuals for this development (GOV/5/10/4). 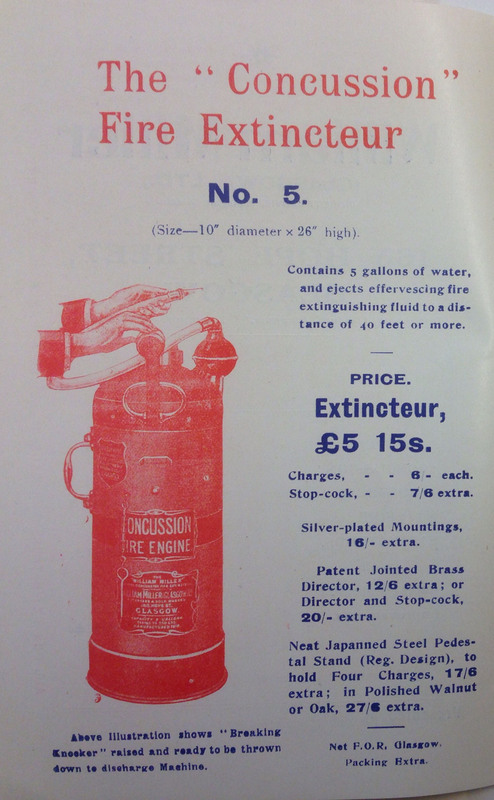 Another interesting file of papers was labelled as ‘Fire Precaution papers, 1928’ (GOV/5/10/8) and includes records such as recommendations for sprinkler systems and fire drills to be carried out in the School; instructions for how to use heated thrones (heated seats for life models) safely; a circular from the Library Bureau about the importance of keeping records safe from the danger of fire; and a brochure from William Miller (Glasgow) Ltd., a company selling ‘Fire Extincteurs’ for fighting fires. This set of records is particularly pertinent given the 2014 Art School fire however there have been a number of instances of fires occurring at the Art School over its history, with School fires recorded in the Board of Governor’s minutes in 1928, 1935, and 1943. The threat of fire is not only a current concern and has always been in the minds of those considering Art School Buildings. We also hold records relating to the opening of this School extension (GOV/5/10/10). The opening ceremony occurred on 18 Dec 1929 and included a luncheon for invited guests at which they ate dishes such as asparagus soup, Cold ham and tongue salad and plum pudding! 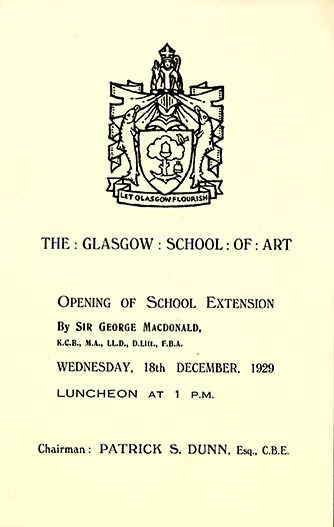 The extension was opened by Sir George MacDonald and the records of the event include a table plan, tickets and programmes, and a copy of the speech of the Chairman of the Board of Governors. The extension was used for various purposes once open and went on to become the Assembly Building and the Victoria Café. The Assembly Building was made for all sorts of functions for the School such as formal balls, parties, and graduation ceremonies. As the School expanded in the 1950s and 60s, it was used as architecture studios and a mezzanine was installed in the Assembly Hall to accommodate more students. The space now known as the Vic Café & Bar was used as studios for the fashion and textiles department and Architecture students until the construction of the Bourdon Building. In the 60s the tenements on Renfrew Street were demolished to make way for the Newbery and Foulis buildings. The Assembly Building was eventually given to the Student’s Association in 1979. The Vic Café & Bar was fitted with the remnants of the original Victoria Café on Victoria Road in the Southside of Glasgow, including the wood panel interior, seats, and the original stained glass and vitreous marble Victoria Cafe signage, which was reinstated in the cafe in 2014. This extension from the 1920s has played a key role in student life with many concerts and gigs hosted there over the years and the Vic is a favourite haunt of many. If you are interested in the records of the School extension you can access the catalogue here. If you’d like to come and see the records, you are welcome to make an appointment to visit us here. Stay tuned for more updates on the cataloguing of GSA here on the blog!